FRANKFURT -- General Motors' European unit, Opel/Vauxhall, is open to alliances beyond that with PSA/Peugeot-Citroen and could build a Chevrolet model to take up excess capacity and help it return to profit. Opel CEO Karl-Friedrich Stracke told workers at the unit's Ruesselsheim headquarters in Germany today that management is studying details of various projects and said any move to shift vehicle development to the French partner would be matched by PSA projects being moved to the Ruesselsheim development center. In a statement, Stracke listed 10 key cornerstones to bring Opel back into profitability. These include expanding into new vehicle segments with cars such as the Mokka subcompact SUV and Adam minicar; entering new markets such as Australia, South America and North Africa, as well as expanding in China and Russia. But Stracke warned that exporting to regions outside Europe won't be enough to operate the European factories at full capacity. Among other strategy points he listed were introducing initiatives to make the brand an industry leader in product quality and customer service and a new, clear brand strategy "geared toward both traditional and attainable potential customers." Opel will also review material costs and seek to reduce the manufacturing complexity of its cars to increase profit margins per vehicle, the CEO said. It plans to run all its plants on three shifts starting with the next Astra compact car, which will be built in two GM Europe plants instead of three. "Given the forecasted market volumes, it would not be viable to produce (the Astra) in more than two plants," Stracke said, adding: "If we run these two plants with three shifts, the production costs for the next Astra generation will be significantly below the costs of building the current Astra. Right now we're operating three plants with just two shifts." He did not name which factories will build the new Astra, but reports have said that GM has chosen Ellesmere Port in England and Gliwice in Poland as the sole plants to build the car. Ruesselheim, currently the third Astra plant, will see production replaced with the Citroen C5 midsized car, reports have said. 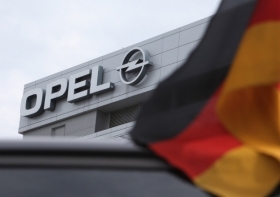 Stracke said Opel is discussing with executives at GM's global headquarters in Detroit and international headquarters in Shanghai on whether to transfer some Chevrolet vehicles to Europe from Korea to improve capacity usage. The CEO emphasized that the growth plan will be presented to the Opel Supervisory Board in June. "It is not a cost-cutting plan at all. It is much rather a comprehensive plan to quickly improve profitability, irrespective of if and how much the market is going to pick up steam. The plan will allow us to significantly increase our margins, market share and sales." GM has said that Opel, which posted a first-quarter loss of $256 million, needs to be overhauled, stoking workers' fears of plant closures. In the first quarter, volume at Opel and UK sister brand Vauxhall fell 16 percent to 227,590 in the EU and EFTA countries, according industry body ACEA. Total industry sales dropped 7 percent. Stracke reiterated that no jobs would be lost at the Ruesselsheim development center, known as ITEZ, which employs 6,500. Opel intends to markedly raise margins, market share and sales by 2016, Stracke said. Model Initiative: Opel/Vauxhall will have invested about €11 billion in a comprehensive new model campaign through 2014. This year alone, the company introduces six new models. "We're following a clear growth strategy and are pushing into new segments where we have not yet been represented," Stracke said, referring to the subcompact SUV Mokka, a new Astra version, a completely new convertible and the Adam, Opel/Vauxhall's stylish new urban vehicle. The Adam will be built at the Eisenach plant, making it the only model in that segment built in Germany. Powertrain Initiative: Opel/Vauxhall will introduce three new engine generations in the next 18 months. This highlights the high pace of Opel/Vauxhall's product offensive. Environment Initiative: Opel/Vauxhall wants to expand its position as the leading manufacturer of alternative propulsions. "We're very proud that Opel/Vauxhall is quite a bit ahead of our competition with products such as the electric Ampera," said Stracke. Export Initiative: Opel wants to enter new markets – including Australia, North Africa, South America and the Middle East. "We've already successfully introduced Opel to the market in Israel and we'll expand our activities in China, Russia and Turkey," Stracke said. The Opel/Vauxhall CEO made it clear that exports to regions outside Europe, however, won't be enough to operate the European factories at full capacity. "We have to do our homework here in Europe." Quality and Customer Satisfaction Initiative: Opel/Vauxhall has launched a number of initiatives that should make the company one of the industry leaders in quality – both in products and customer service. New Brand Strategy: Opel/Vauxhall is working on a new, clear brand strategy that is geared toward both traditional and attainable potential customers. Increasing profit margin per vehicle: Opel/Vauxhall has launched several initiatives to increase its contribution margins. This, in particular, includes a thorough review of the material costs. Opel/Vauxhall also wants to reduce the manufacturing complexity of its cars. New Alliances: Opel/Vauxhall is open to beneficial partnerships such as the one that GM recently made with PSA Peugeot Citroen: "At the moment we're at a stage where we're studying several specific projects with PSA in detail," said Stracke. The Opel/Vauxhall CEO emphasized that the alliance is balanced in nature. "If we decide to move an Opel/Vauxhall development project to PSA, then we'll balance it by bringing a PSA project to Rüsselsheim." Stracke repeated that no jobs will be lost in the International Technical Development Center in Rüsselsheim because of the alliance – in fact, the alliance strengthens the development center's future. Production Strategy: Opel/Vauxhall is upgrading its manufacturing plants. "The clear goal here is to run each of the plants on three shifts," said Stracke. The first example of that will be seen in conjunction with the allocation of the next Astra generation. "Given the forecasted market volumes, it would not be viable to produce in more than two plants. If we run these two plants with three shifts, the production costs for the next Astra generation will be significantly below the costs of building the current Astra. Right now we're operating three plants with just two shifts." Opel/Vauxhall is planning on investing more than €300 million in the two future Astra plants. Studying Production of Chevrolet Models in Europe: "We're in discussions with management in Detroit and Shanghai to study whether or not there is merit in building Chevrolet vehicles in Europe to improve capacity usage," explained Stracke. The Opel/Vauxhall CEO emphasized that the full growth plan will be presented to the Opel Supervisory Board in June: "It is not a cost-cutting plan at all. It is much rather a comprehensive plan to quickly improve profitability, irrespective of if and how much the market is going to pick up steam. The plan will allow us to significantly increase our margins, market share and sales." The company's home plant in Rüsselsheim plays a key role in the forward-looking strategy. "It is our most modern factory, has an outstanding workforce and produces exceptional quality. I want to run this plant on full capacity. But Rüsselsheim also has to remain competitive, and so we have to increase flexibility and significantly reduce our costs per vehicle," Stracke said. Stracke reiterated with the employees that Opel will stick to existing agreements, such as the existing labor agreement through 2014. "And the quicker we become profitable, the quicker we'll share it with you."